Email and test marketing app that speaks to your Audience! Today you need to take your prospecting, fundraising and communications to the next level with Connexus vB, our video email and video text app. Make a video on your phone or go high tech; Conexus vB is an easy-to-use system that delivers effective messaging - complete with video embedded in the email or text message without annoying and time consuming links. Simply click and play, and your message is delivered in your words right to your prospects, employees or customers computer, tablet or mobile device. Affordably priced, Connexus vB makes it easy for organizations of all sizes to reach their targets through sight and sound. Click to the right and check out! Click here and view an actual video email. Custom branded to your business, with video panel, images, text and action button links. It has it all!! Learn more about the company that started videoBlastr.com. See how others are using videoBlastr to reach the next level in online communication. 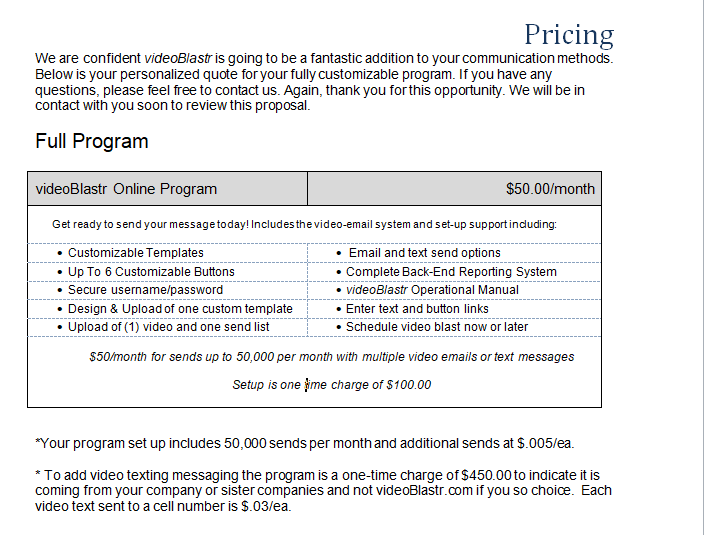 Curious what video-email will look like? Try it yourself. Questions Still not Answered? Contact us to get your question answered! © 2013 - videoBlastr.com by Resource Communications Inc.